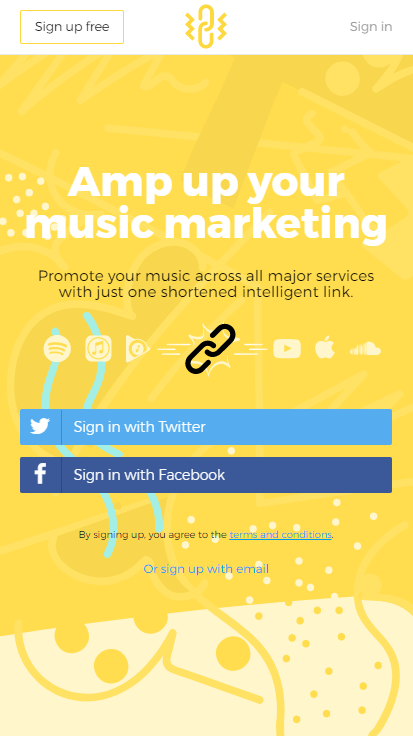 Amplify.link is an in-house project that allows artists to share their music across all streaming and download services, with just a single shortened intelligent link. Giving users the freedom to choose their preferred service, with mobile deep links to all major music apps across all devices. As lifelong music lovers, DJs, producers and tech nerds, we were becoming increasingly aware of the problems with sharing music online in the modern digital age. 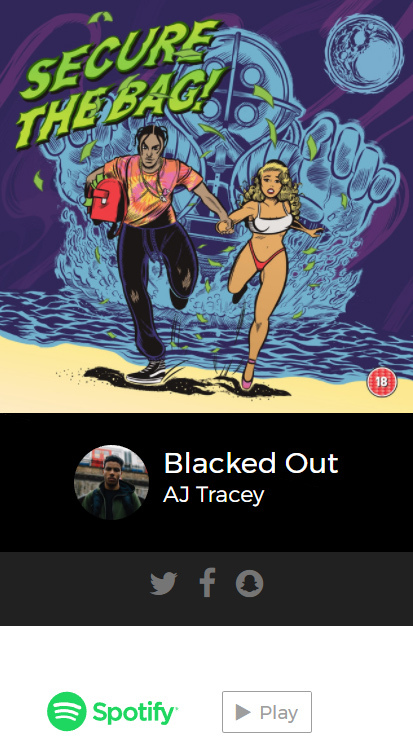 We are blessed with a wealth of quality streaming platforms and ways to listen to or buy music these days. 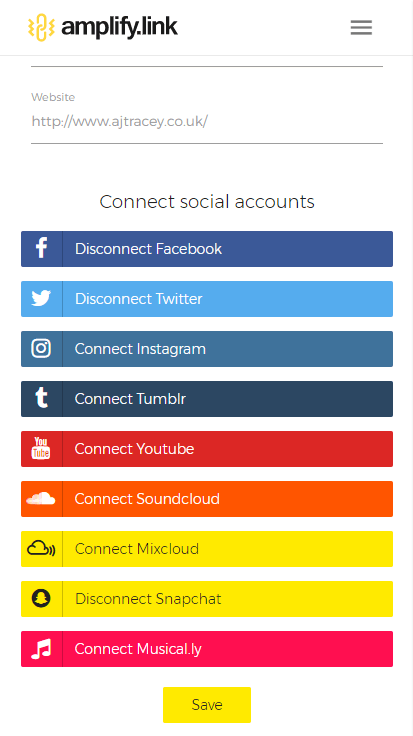 The problem is that if you want to make it easy for fans to listen to your music on their preferred service then you need to put out several links to different platforms. If you wanted to link to your release in a tweet or instagram bio you could really only pick one. Amplify.link is our answer to this problem. The core function of Amplify.link would be to allow artists to create a mini-landing page with links out to all major streaming services. We didn't want to stop there though. The core function of Amplify.link would be to allow artists to create a mini-landing page with links out to all major streaming services. We didn’t want to stop there though. We wanted to build something that made the whole process as quick and as easy as possible. It was also essential that the user experience for both artist and fan was fast, intuitive and beautiful. 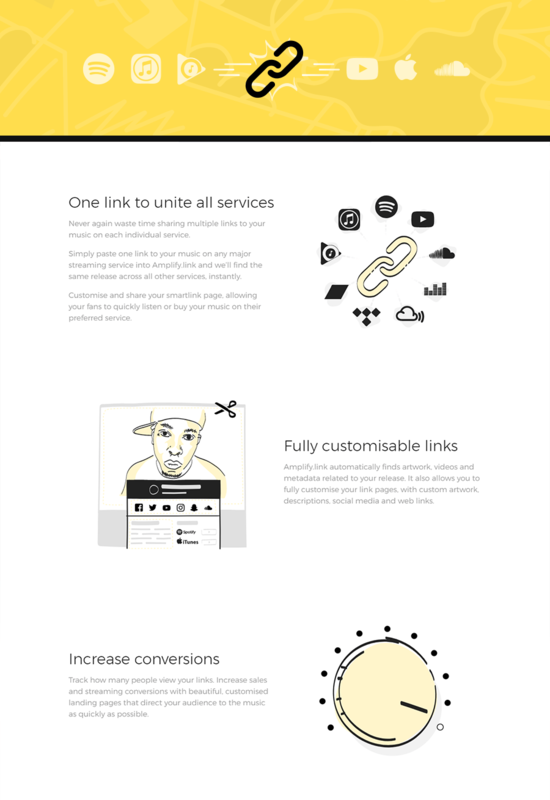 With everything we do at LOUDD we aim to centre innovation and efficiency at the core of our creativity, Amplify.link is our solution to simplifying the digital marketing process. It was also essential that the user experience for both artist and fan was fast, intuitive and beautiful. It quickly became apparent that we would need to have some kind of sign up process to stop people and bots from abusing the service. We decided that offering both Facebook and Twitter as sign in options would make the process as quick and as simple as possible. For the social media shy, we added an option to sign up with email too. Careful consideration was given to how the link creation process would work. We could have just asked users to paste in their links manually for each service when building a new page. We wanted to do one better though. Making full use of available APIs, we put together a system whereby a user can paste just one link to their track or album on any major service, and Amplify.link will search for a matching release across all other music platforms. With this approach, we could drastically reduce the amount of time it would take to put together a landing page. We built in a manual override too as a failsafe and to give the user total control over their links. 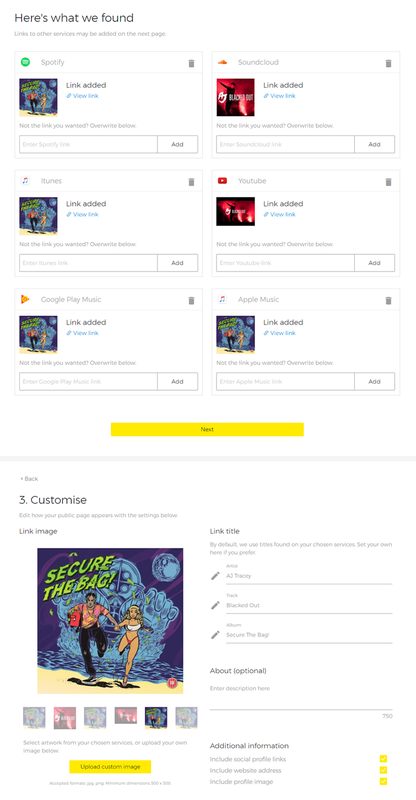 After confirming that the links are correct, the next stage of the process would allow the user to customise the look and information present on their landing page. Another opportunity presented itself here to help streamline the whole process. Rather than make users enter all their information manually, the system would look for and populate the relevant fields with all metadata and artwork associated with the release. Again, we allowed for manual override so the user retains full control. 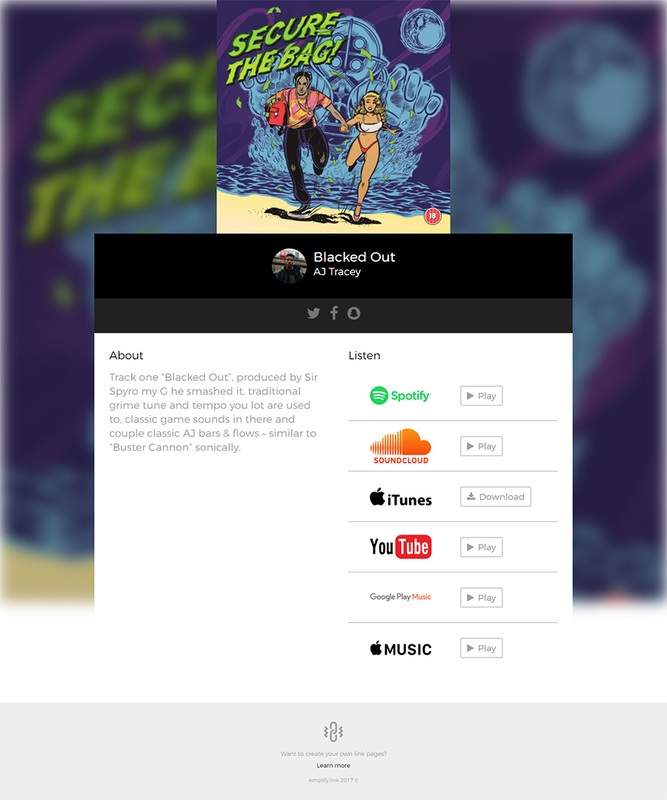 Other options made available on this page would include: either a YouTube or Soundcloud embed directly on the landing page, inclusion of links to social media profiles, a website url, profile image, and a short ‘about’ section. Once the user is satisfied they can progress to the next step in the process, where they are given a preview of exactly how their public landing page will appear. They can then simply click ‘Finish’ to create their link, or ‘Edit’ to go back and change anything about their link. We purchased a secondary domain, ampl.ink, which would be used to keep links short and beautiful. As a full service digital agency, we know first hand the importance of strong branding and beautiful, functional design. We wanted to create a vibrant and playful, yet strong brand. Something approachable, honest and reliable. For the logo, we ended up settling on a rather literal interpretation of the name; a link icon with zig zags to represent amplification. This simple, balanced mark, paired with a bold sans serif font looked great at all sizes, and would surely stand the test of time. 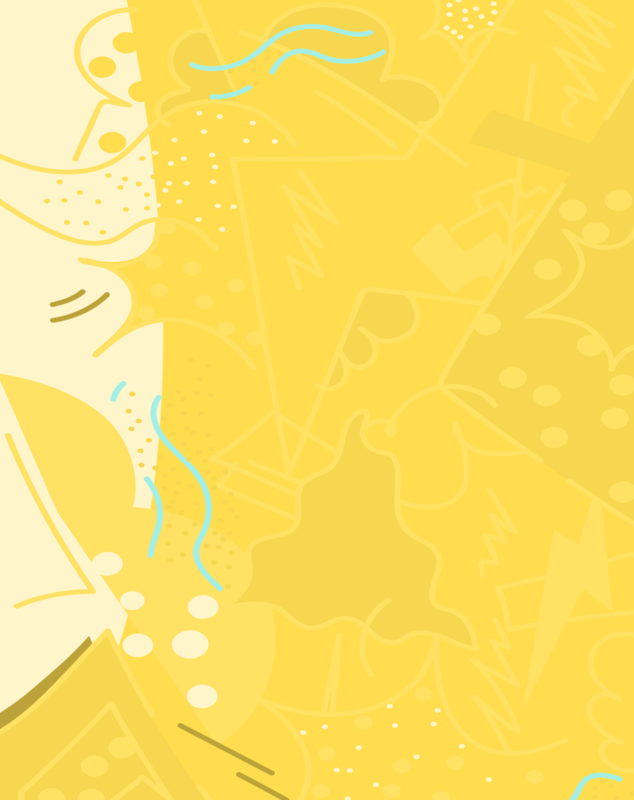 After establishing a suitable colour palette, we created artwork and custom illustrations to use throughout the site. This would give it a totally unique look that perfectly represents our brand, and help our product to stand out in a world of stock imagery and recycled icons. While we knew the vibe and direction we wanted to take the brand in, at the same time we felt a different approach would be needed when it came to the public landing pages that our users would create. We stripped back all our branding and colours for this page, leaving just a small, unobtrusive link to our main site in the footer. Rather than impose our own branding on those landing pages, we put the artwork of the release front and centre, allowing the page to take on whatever characteristics the artist intended. We used a greyscale palette for all graphical elements, and kept the design simple to keep the focus squarely on the work and function of the page. The project is currently in the beta testing phase. We gave access to interested music industry professionals who had registered their interest with us. The beta testing round has been a great success so far, we have received some crucial feedback which will shape the direction of the project moving forward and will allow us to deliver an even more effective, efficient and intuitive solution. We aim to launch the full public facing site by December 2017, with a full digital marketing campaign and PR roll out to coincide with this. This is just the start of the journey here. We have so much incredible functionality based on our innovative ideas to add to the project in further iterations. 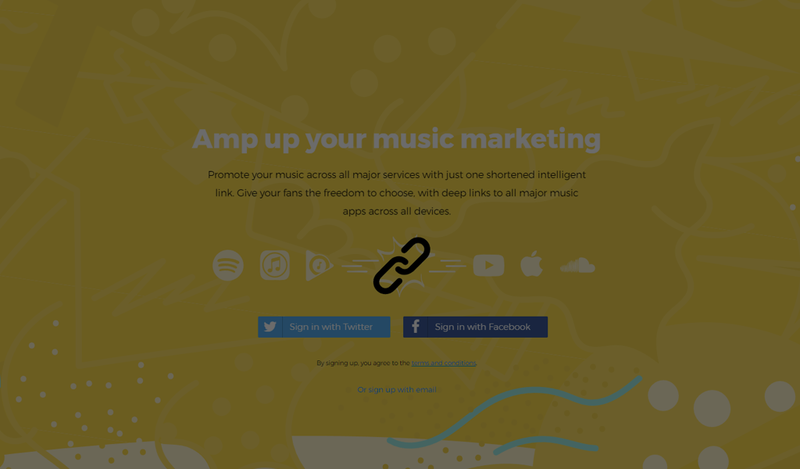 We believe Amplify.link could become the solution for music marketing in the digital age.